ikepela is redambition: What will you be...? You haven't told me yet. What will you be...? You haven't told me yet. 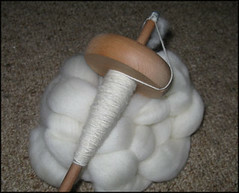 You're Polwarth, you're deliciously soft and a joy to spin... and there isn't a huge amount of you. Please whisper what you want to be when you are finished!